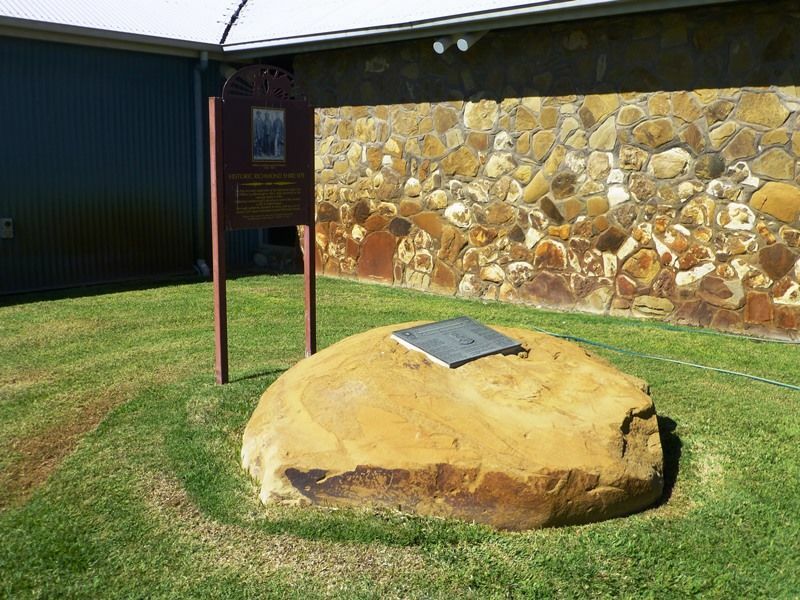 A cairn marks the site where William Landsborough camped (Camp 24) on O`Connell Creek on the 13 March 1862 while searching for the explorers Burke and Wills. This was the first recorded exploration of the Richmond area. This cairn marks the place on O`Connell Creek where prolific Queensland explorer William Landsborough, set up camp on March 13 1862, during the search for the most tragic exploration journey in Australian history- that of Burke and Wills` attempt to be the first to traverse the Australian continent from south to north. Burke and Wills left Melbourne on August 20, 1860, set up base camp at Coopers Creek on November 11 and reached the Gulf on February, 1861. 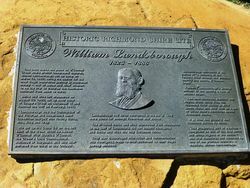 Landsborough was the Commander of the Victorian and Queensland Land Expedition charged with finding Burke, Wills, King and Gray. He set up Camp 24 on the left bank of the creek which he named O`Connell after Maurice O`Connell, the Crown's Land Commissioner, stationed at Dalrymple, and who later perished from thirst in the outback. Landsborough had three Aborigines in his party. They were Jamie (or Jemmy), Fisherman and Jackie. The ill-fated Burke and Wills exploration from Melbourne to the Gulf of Carpentaria did not include Aborigines and Burke and Wills ate only European foods. They also discouraged interaction and communication with Aborigines, much to their detriment as their tragic journey unfolded. Landsborough mentioned in his journal of " - following of the Flinders River through the pastoral country and naming of O`Connell Creek." Following Landsborough`s glowing account of the country, a rush of settlers began. 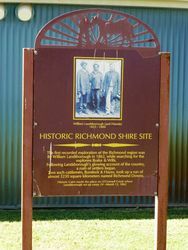 Two such cattlemen Bundock and Hayes, drove cattle from the Richmond River district of New South Wales and later took up a run of 3230 square kilometres named Richmond Downs. It is from this property that Richmond derives its name. This prosperous part of Australia - recognised as one of the best cattle and sheep regions in the nation - was first discovered and traversed by one of the greatest explorers in Australia, William Landsborough.